You will always know that you are getting what you pay for from your network service provider. In-Service monitoring delivered through NetTESTER leaves you in control of your SLA. On-Demand performance measurement with NetTESTER ensures you can verify SLA parameters independently with real time reports. Your company will be able to rely on your network performance which can underpin your business. This is especially important if your business involves the provision of services to your customers using this network. Having identified an issue, you will know exactly who to call for a fix, saving both time and money. Long dark fibre links? Deploy NetTESTER OTDR so you will be able to direct resources quickly to the physical source of a fibre problem, thus saving both time and money in getting the network back up to full capacity. Are you getting what you pay for from your network provider? Nobody likes paying for something they are not getting, but more importantly your own customers are depending on your services. But what about my SLA? Just having a Service Level Agreement (SLA) does not guarantee that you are getting the service you are paying for. Your company or your customers are relying on the performance of your network. How can I independently check whether my network provider is actually meeting their SLA? This is where a Performance Assurance Device is invaluable, embedded within your Ethernet Network, constantly measuring actual performance against your SLA parameters and alerting you to any performance loss. Can't I use my fully featured Network Tester? Why can't my routers check my SLA? Some routers can offer test and monitoring capabilities for a price! Can the Carrier not tell me performance against the SLA? Why would carriers share network performance details which show up the flaws in their networks? Some carriers can offer customers a monitoring service at a price! But how comfortable are you with outsourcing the monitoring of your critical business services to the very company that is supplying that service to you? So, what is a Performance Assurance Device? Metrodata's NetTESTER is a Performance Assurance Device that can independently measure and monitor performance against your SLA. A comprehensive set of tools for Network Performance Assurance, performing both 'out-of-service' testing and 'in-service' background monitoring of your LAN and WAN connections up to 10gb. Efficient networks are crucial to servicing the many bandwidth hungry "mission critical" applications that are used in modern organisations. Largely due to their personal experiences with domestic Internet provision, users are quick to point the blame for any perceived reduction in application responsiveness firmly on "the Network", so it is important that real network issues can be isolated and resolved quickly. By deploying Metrodata's embedded, always-on Test and Monitoring devices, standard test profiles including RFC2544 and/or Y.1564 can be instigated 'on-demand' at any time between any points in the network, with results monitored remotely, in real-time, directly from the Network Operations Centre (NOC). Whilst ideal to verify new link implementations or for troubleshooting purposes, during normal operation such tests are inappropriate. During regular in-service usage, Metrodata's minimally invasive background test functions can be enabled to pro-actively monitor key links throughout the network. Alarms are sent directly to the NOC in the event of a breach of pre-defined SLA parameters, immediately alerting Operations staff to the need for further analysis. The NetTESTER family offers a range of powerful & versatile Ethernet network test and monitoring capabilities for the Enterprise sector. Intended for 'always-on' deployment at key points throughout the network, NetTESTER represents a new paradigm in Performance Assurance. Most frequently deployed at locations throughout a multi-site Wide Area Network, NetTESTER devices may be installed either directly in the 'data path', between for example a Service Provider's WAN termination point and the Enterprise's own LAN equipment, or simply on any convenient Switch or Router port within the LAN. In the former case, NetTESTER units are fully transparent to user traffic and yet perfectly positioned for test, monitoring and impact analysis applications. 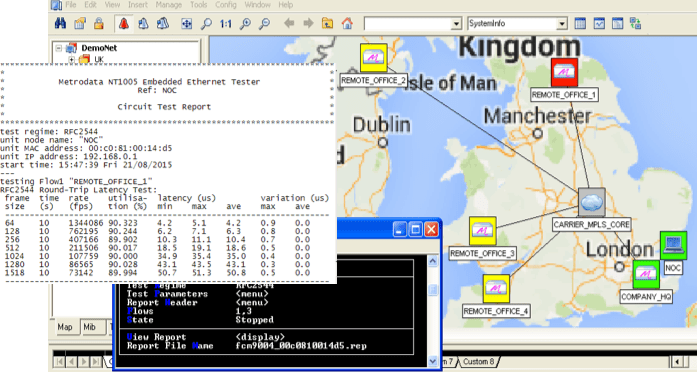 In the latter, whilst not directly in the data path between LAN and WAN, NetTESTER is ready 'on-demand' for test-traffic generation, loop-back and analysis of traffic performance to/from any other similarly equipped site within the network, and can provide 'always-on' background monitoring and alarming in the event of performance degradation relative to pre-defined threshold criteria. The NetTESTER (each available with a variety of PSU options for flexibility and resilience), include Metrodata's custom 'MetroSAM' (Service Assurance Module) hardware for test-traffic generation and loop-back, supporting industry-standard test profiles RFC 2544 and ITU-T Y.1564, for both Layer-2 (Ethernet Switched) and Layer-3 (IP Routed) environments. Each device also supports background monitoring via standard protocols including ITU-T Y.1731, for Ethernet Switched environments, and TWAMP ('Two-way Active Measurement Protocol'), for IP-Routed infrastructures. Users access the NetTESTER either via a local terminal/emulator, or more normally remotely across the network from a Management console application via Telnet/SSH or Web Browser, to configure and instigate test procedures or to monitor results. In the case of background monitoring, SNMP 'Trap' alarms are issued in the event of a breach of pre-determined performance threshold parameters, including throughput, delay (latency), delay variation (jitter), packet-loss, and overall 'uptime'. If NetTESTER units are deployed then the Enterprise Network manager can thoroughly test the network, whenever required, throughout the organisation. Nevertheless, NetTESTER can bring additional value through In-Service monitoring. 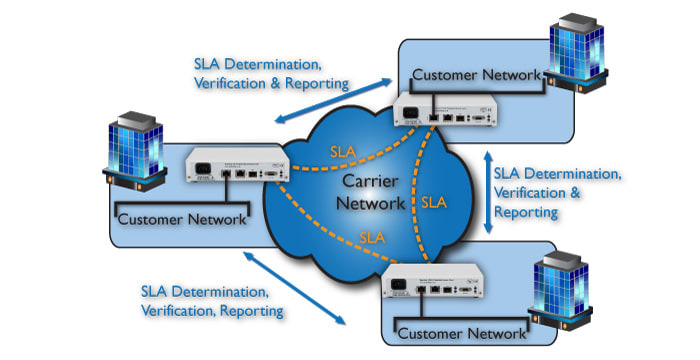 By implementing protocols primarily developed for the Packet-based Carrier WAN industry, NetTESTER family devices can provide background 'in-service' monitoring of network performance and SLA characteristics. The RFC2544 and Y.1564 test profiles mentioned previously are limited as they require full availability of the service being tested, meaning that these tests are inappropriate for 'in-service' usage. So, the ability to monitor network performance whilst the network is fully available for regular users, without impacting on the throughput of potentially critical data, is an important additional benefit. Specifically, leveraging their development heritage from Metrodata's family of Carrier EDD’s, the NetTESTER units support the Layer-3 'Two-Way Active Measurement Protocol' (TWAMP) for in-service monitoring of network Delay (Latency), Delay Variation (Jitter) and Packet-Loss parameters across Ethernet and IP infrastructures respectively. 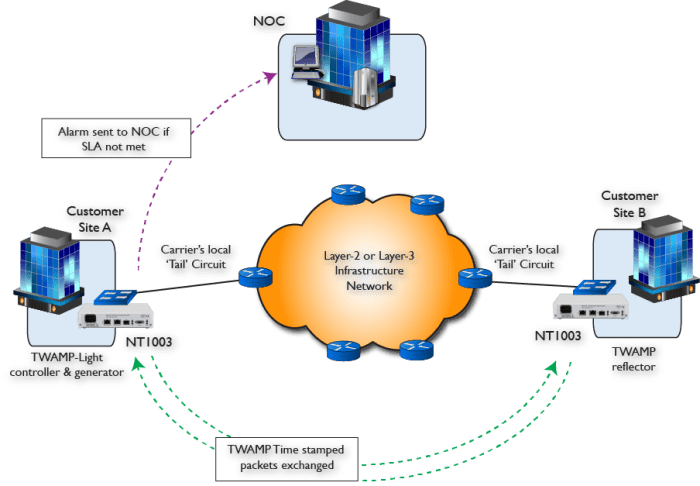 These features enable NetTESTER devices to actively monitor key performance characteristics and, furthermore, to issue pro-active SNMP 'Trap' alarms to the Network Operations Centre in the event that any monitored link within the WAN domain fails to meet pre-determined SLA requirements. This 'in-service' monitoring functionality also facilitates the collation of long-term traffic profiling data which can be invaluable for understanding the overall characteristics of a network under variable load conditions during an extended period. This underlines the real benefit of permanently embedded and always-accessible test devices, when compared with even the most sophisticated 'plug-in' test sets. The diagram below illustrates the case of the TWAMP protocol being used between two NetTESTER devices to provide alarms to the NOC, should pre-determined maximum levels for Delay (Latency), Delay Variation (Jitter) or Packet-Loss Ratio, be exceeded for traffic across the WAN link between remote sites A and B. The NetTESTER units also support L-1 network testing features for physical layer faults. Specifically, both products support TDR and optionally automated OTDR (Optical Time-Domain Reflectometry) functionality. OTDR functionality is particularly useful for long haul dark fibre connections where there is concern about disconnection or breakage of the fibre. Metrodata's NetTESTER when enabled with OTDR capabilities can monitor and generate alarms in the event of a fibre fault, issuing an SNMP Trap alarm which when translated via a MIB can produce a message "Fibre length previously 40.258m. At time 13:04:26, service down, with fibre length reported as 15.219m". The diagram below illustrates how they could be positioned in the network. OTDR is particularly useful in assisting network managers with the notoriously difficult job of locating the exact location of fibre faults and represents another value-adding benefit of a permanently embedded NetTESTER in your network. OK, but how is all this 'on-demand'? Whilst we've been detailing the merits and procedures involved with 'traditional' Ethernet circuit testing, it's clear that using expensive equipment, which requires skilled operators, is fine provided that one has both of these in the right place at the right time and available to be deployed. Whilst this may be readily possible for initial circuit commissioning, what about subsequent periodic health-testing during scheduled maintenance windows, or what about ad-hoc troubleshooting in the event of user-reported problems? This is where Metrodata's NetTESTER family comes into its own offering On-Demand Performance Measurement. Metrodata offers the NT1003, NT1005 and NT10G05 NetTESTER’s as affordable devices featuring custom hardware specifically designed for the task of acting as permanently-available, remotely manageable, embedded test traffic generation and/or test traffic reflection devices, for deployment in networks featuring Layer-2 (Ethernet) and/or Layer-3 (IP) Carrier infrastructures. These devices could be placed in the 'data-path', i.e. between Service Provider's demarcation point and the Corporate LAN, or else beside the Corporate LAN. If in the “data-path” then these devices would normally be transparent to all traffic passing to/from the WAN. Metrodata’s family of NetTESTER products currently include the NT1003, the NT1005 and the NT10G05. Developed to the same Carrier-quality criteria born of over 25 years of supply to the Telecoms Industry, and with a heritage from Metrodata's well-established MetroCONNECT Carrier Ethernet Demarcation product line, the NetTESTER products offer advanced custom-hardware based facilities for comprehensive test and monitoring for both Layer-2 (Ethernet Switched) and Layer-3 (IP Routed) network infrastructures.